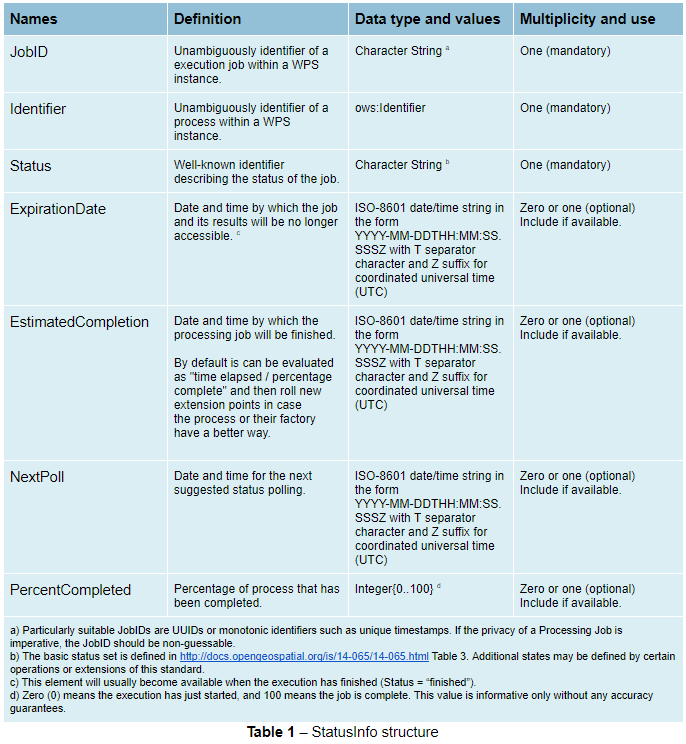 The GetCapabilities operation requests details of the service offering, including service metadata and metadata describing the available processes. The response is an XML document called the capabilities document. The required parameters, as in all OGC GetCapabilities requests, are service=WPS, version=1.0.0 and request=GetCapabilities. The DescribeProcess operation requests a description of a WPS process available through the service. The parameter identifier specifies the process to describe. Multiple processes can be requested, separated by commas (for example, identifier=JTS:buffer,gs:Clip). At least one process must be specified. As with all OGC parameters, the keys (request, version, etc) are case-insensitive, and the values (GetCapabilities, JTS:buffer, etc.) are case-sensitive. GeoServer is generally more relaxed about case, but it is best to follow the specification. 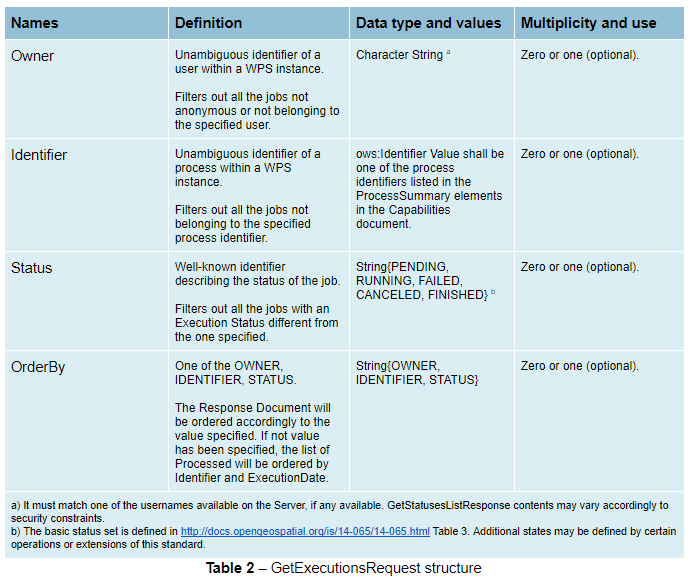 The Execute operation is a request to perform the process with specified input values and required output data items. The request may be made as either a GET URL, or a POST with an XML request document. Because the request has a complex structure, the POST form is more typically used. The inputs and outputs required for the request depend on the process being executed. GeoServer provides a wide variety of processes to process geometry, features, and coverage data. For more information see the section Process Cookbook. Below is an example of a Execute POST request. The example process (JTS:buffer) takes as input a geometry geom (in this case the point POINT(0 0)), a distance (with the value 10), a quantization factor quadrantSegments (here set to be 1), and a capStyle (specified as flat). The <ResponseForm> element specifies the format for the single output result to be GML 3.1.1. For help in generating WPS requests you can use the built-in interactive WPS Request Builder. According to the WPS specification, an asynchronous process execution returns a back link to a status location that the client can ping to get progress report about the process, and eventually retrieve its final results. Upon receipt GeoServer will do its best to stop the running process, and subsequent calls to Dismiss or GetExecutionStatus will report that the executionId is not known anymore. Internally, GeoServer will stop any process that attempts to report progress, and poison input and outputs to break the execution of the process, but the execution of processes that already got their inputs, and are not reporting their progress back, will continue until its natural end. This is an extension of the GeoServer WPS Service. This operation is specific to this GeoServer instance. This specific operation allows a client to recognize the list of WPS Executions. 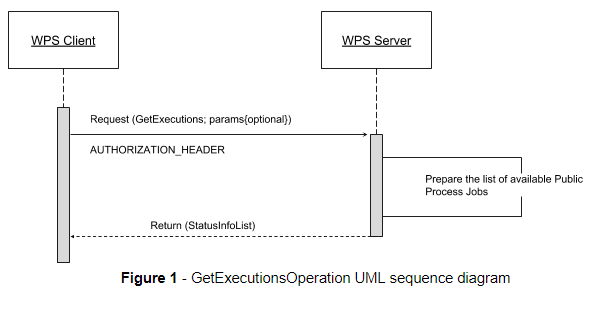 The client makes a simple “GetExecutions” request to the WPS Server, in order to get back an XML document containing the list of current Execution Statuses. It is also possible to filter the “GetExecutions” request along with simple parameters, in order to refine the output and get back only the executions status we are looking for. Adding a bit more to this, AUTHORIZATION headers must be sent along with the “GetExecutions” request; the WPS Server will be able, if the security subsystem is available and enable on the latter, to prove the list resources to the client itself. The operation will return only the list of available Executions the logged in user has started, except in the case it is an Administrator. In that case he will be able to get the whole list. If the “lineage” option of the WPS Execute Request has been specified, the client will be able to retrieve the Execute Inputs values provided to the process Identifier. Refers to http://docs.opengeospatial.org/is/14-065/14-065.html 9.5 and extends it. The StatusInfo document is used to provide identification and status information about jobs on a WPS server. The operation adds additional fields to the StatusInfo Document reporting also the WPS Process Identifier and other information on estimated execution and expiration time. The GetExecutions Operation allows WPS clients to retrieve the list of available process jobs running on a WPS instance. The output is returned in the form of an XML document. The GetExecutions Operation returns only the list of available Executions the logged in user has started, except in the case it is an Administrator. In that case he will be able to get the whole list. The GetExecutions Request is a common structure for synchronous execution. It inherits basic properties from the RequestBaseType and contains additional elements that allow to filter out, refine and order the list of available Process Jobs. The GetExecutionsResponse it is always in the form of an XML document. Except in case of Exception, the response document will contain a list of StatusInfo elements filtered, refined or ordered accordingly to the specified parameters. Response paging is the ability of a client to scroll through a set of response values, N values at-a-time much like one scrolls through the response from a search engine one page at a time. Similarly to the WFS 2.0.0 response paging mechanism (see See section “7.7.4.4 Response paging” of the specification), the output will show to the client the following attributes as part of the response document. When a WPS server encounters an error while performing an GetExecutionsResponse, it shall return an exception report as specified in clause 8 of [OGC 06-121r9]. If appropriate, the server shall use additional exception codes as defined in this section. 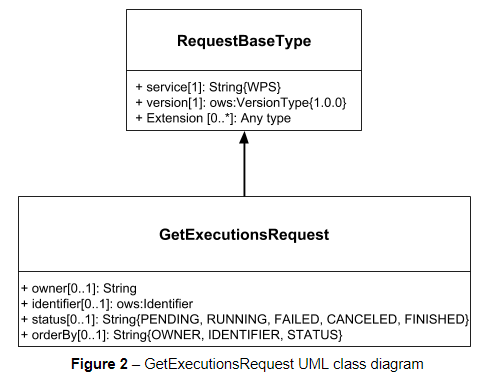 The GetExecutions Operations tries (best-effort) to retrieve the Input values specified from the Execute Request iff the lineage option has been provided to the Execute Request.